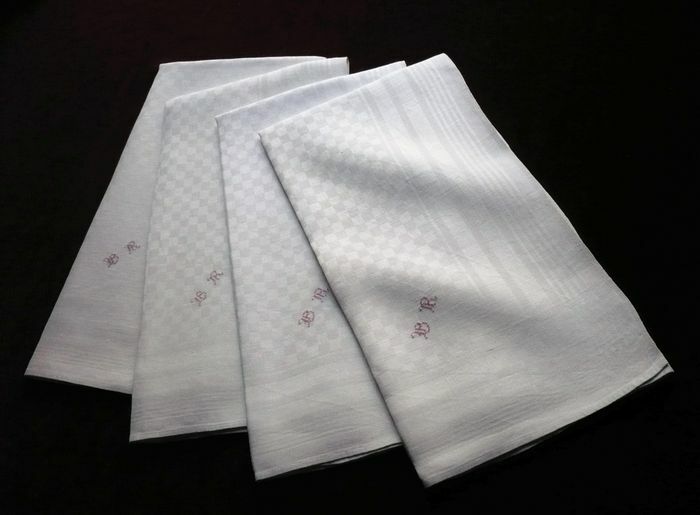 A charming and elegant set of four late 19th century kitchen towels loomed of a pure white and very silky pure linen damask. These lovely towels have a geometric motif in the damask of small squares and stiped borders. A delicate monogram, "BR," is hand embroidered in pale red cross stitch in one corner. The fineness of the linen indicates that these probably served as "essuie verres," the towels that were used primarily for drying fine crystal and glass ware. The hems are hand stitched with miniscule points and all four towels are in impeccable condition. A second set of four identical towels is available upon request. Dimensions: 34 x 25.5in.